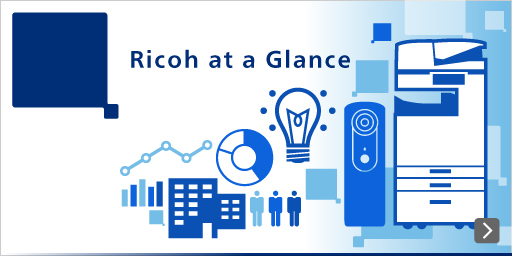 Ricoh has developed a photo (UV)-curable inkjet ink that significantly reduces skin sensitization causing allergic dermatitis, such as itching or irritation of skin. Photo-curable inkjet ink is cured instantly when irradiated, so it is effective for applications requiring quick-drying or printing on a material difficult to penetrate liquid. It has been used in familiar places for commercial printing of detailed statements or printing on plastic cards, for outdoor advertisements such as signboards, and advertisements on wrapping tramcars and buses, or printing on plastic housings, like those on home electrical appliances and IT equipment. It is also used for 3D printer applications, which mold samples for machine components, using 3D data directly from a computer. Toxicity to the human body imparted by the inks currently used, in liquid state before photo irradiation, are not always properly taken into account; most have skin sensitizing properties (*1) that cause allergic dermatitis, such as itching or irritation of skin, The physical burden this places on those working with printers has been our concern. Conventional photo-curable inkjet ink uses a low viscosity acrylic ester (*2) to ease ink discharge from minute nozzles and to speed curing reaction at the time of photo irradiation. This process causes skin sensitization. The new ink Ricoh has developed does not use this material. Instead, to eliminate skin sensitive substances, it uses methacrylate (*3), used also in dental care. Although many kinds of ordinary methacrylate are poor in curing reactivity against photo-irradiation, we found a specific molecular structure with favorable curing reactivity and successfully devised additives to develop ink discharge properties and curing reactivity comparable to conventional inks. Further, the new ink comprises materials with sufficiently insignificant acute oral toxicity (illustrating the criticality when erroneously swallowed), mild from irritating properties in dermal irritancy (causing chemical scalding), negative (meaning no problem) in mutagenicity (carcinogenicity risk to mutate biological cells). We expect to relieve the physical burden on long-time workers at printing sites. Although physical reactions may not always occur when conventional ink with skin sensitizing properties is used, due to individual susceptibility to allergic reactions, in those cases where allergic reactions do occur, such as itching or irritation of skin, the new ink should yield improvements. There are cationic polymerization techniques and radical polymerization techniques (*4) in the curing reaction of photo-curable inkjet ink. With the cationic polymerization technique, the polymerization initiator, which initiates the polymerization response to the photo-irradiation, is very expensive. And because strong acids are generated, in principle, all parts coming in contact with the ink through the inkjet system require acid resistance. This placed heavy restrictions on selecting printer components like the ink print head and printer components. Because the new ink uses a radical polymerization technique, which allows the use of inexpensive raw materials, the cost can also be lowered. Beyond that, the selection of components becomes more flexible, because, in principle, neither acid nor alkali is generated. Adhesion on substrates, which was an issue with the radical polymerization technique, was also improved with the development of new additives. 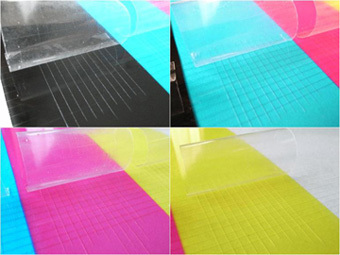 In addition, sufficient adhesion has been confirmed on polypropylene film, a typical target material with difficult adhering properties (substrates) (Figure 1). Japanese Industrial Standards (JISK5600-5-6) prescribes cutting the cured ink layer to reach the substrate and to form grids there, then, to apply a pressure-sensitive adhesive-tape there and aggressively peel it off. The number of grids not removed with the adhesive tape is then counted. Adhesion is judged better with a higher grid count. The photo-curable inkjet ink reported here yielded a result in which 100 among 100 grids remained on polypropylene film (after surface treatment), which is a typical substrate with difficult adhering properties. (*2) (*3) The individual substances generated by the chemical bond of alcohol and acrylic acid, and alcohol and methacrylic acid , are acrylic acid ester and ester of methacrylic acid, respectively. These are classified as monomers with small molecular weight, and have the nature to join mutually, reacting to light or heat, and change into polymers with a large molecular weight. For an inkjet ink, stability when discharged from a minute nozzle is important, which requires sufficiently low viscosity. For that reason, low viscosity acrylate and methacrylate must be used. However, low viscosity acrylate, in most cases, has high skin sensitivity. On the other hand, methacrylate is safe, including for skin sensitivity, compared with acrylate; some are used also for dental care. Compared with acrylate, however, properties are poor in polymerization reactivity. (*4) In order to initiate a polymerization reaction by direct photo-irradiation on a monomer, a polymerization initiator must be mixed. Photo irradiation on a radical polymerization initiator and on a cationic polymerization initiator gives high energy to each, resulting in the states called radical and cation. The polymerization reaction begins with the energy shift to monomer from here. The radical polymerization technique has been conventionally applied in many fields, such as for printing inks, paints and adhesives, so there are many inexpensive radical polymerization initiatorｓ available on the market. On the other hand, because the cationic polymerization technique is not diffused like the radical polymerization technique, the cationic polymerization initiator is expensive, and we need a dedicated monomer. Further, as a cation, slightly generated also in the state without photo-irradiation is a strong acid, so the ink print head and all components that come in contact with the ink must have high acid resistance.